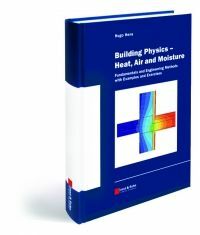 The book combines the theory of heat and mass transfer with typical building engineering applications, leading into one overall model for the real hygrothermal response of building components. It is the result of thirty years teaching, research and consultancy activity. Hugo S.L.C Hens is professor at the University of Louvain (C.U.Leuven), Belgium. After four year of activity as a structural engineer and site supervisor, he returned to the university to receive a PhD in Building Physics. He taught Building Physics from 1975 to 2003 and Performance Based Building Design from 1970 to 2005 and still teaches building services. Dr. Hens is the author of several text books in Dutch on Building Physics, Performance Based Building Design and Building Services. He has authored and co-authored over 150 articles and conference papers, wrote hundreds of reports on building damage cases and their solution, introduced upgraded, research-based concepts for highly insulated roof and wall construction and directed several programs on building-energy related topics. For ten years he has been coordinator of the international working group CIB W40 on Heat and Mass Transfer in Buildings. At present he is operating agent of the International Energy Agency's EXCO on Energy Conservation in Buildings and Community Systems, Annex 41 Whole Building Heat, Air and Moisture Response.